By 1923 the nation had gone broadcast crazy. In 1922 there had been 100,000 radio receivers produced, by 1923 that number stood at 500,000. In 1922 there were 30 radio stations on the air, by 1923 there were 556 on the air. It would be no exaggeration to say that the inventions of Armstrong were in a big way responsible for this enormous growth. Armstrong had not been ignoring his superheterodyne. He realized early on his invention could be the answer to the long felt need for a sensitive, easy to operate broadcast receiver. 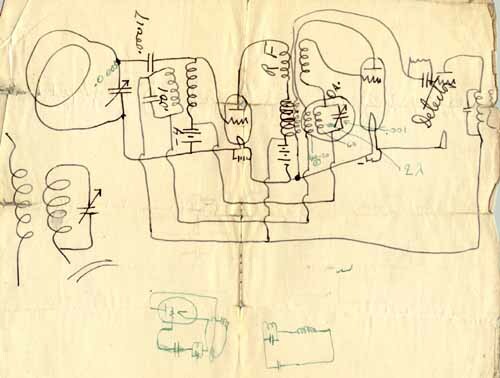 Through his winning court battle with de Forest, his feed-back and superheterodyne negotiations with Westinghouse and his superregenerative negotiations with RCA, Armstrong had been developing his superheterodyne into a commercially doable reality. Harry Houck, who had impressed Armstrong in France with his ability to turn ideas into hardware, would be a key player in taming this circuit - and tame it they did. By early 1923 Armstrong had demonstrated a five tube set to the Vice President of RCA, David Sarnoff. To say Sarnoff was impressed would be an understatement. Sarnoff saw this as the receiver which would guarantee RCA sales leadership and stop 'encroachment' of its market share by the likes of Atwater Kent. Also weighing heavily on his mind was the fact that AT&T, a potential competitor in receiver manufacturing, had recently submitted a superheterodyne to RCA for evaluation. In fact, Sarnoff and the RCA board of directors were so impressed with Armstrong's equipment that the million dollar orders placed just two days before, to Westinghouse and GE, to cover the '23 - '24 Christmas season, were canceled. Sarnoff's plan was to scoop the following season. They did - the superheterodyne introduced in February of 1924 was a runaway success. 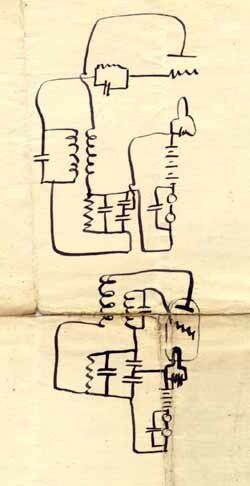 Sketches, on the front and back of a paper scrap, by Armstrong (first) and Houck (second), made during development of the pre-production superheterodyne. 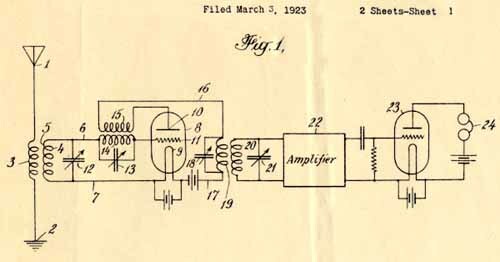 Besides actually building all of the pre-production models, Harry Houck's main contribution, to what would become the first RCA production superhet, would be his second harmonic invention. There were several inherent advantages to this scheme - reduction of one tube by combining the functions of oscillator and first detector; elimination of antenna radiation, and; reduced interaction between antenna and oscillator controls. Houck saved an additional tube by reflexing the first IF amplifier back through the RF amplifier. Drawing from Houck's second harmonic patent, #1,686,005, issued on October 2, 1928. Harry Houck would eventually receive at least $100,000.00 from Armstrong for his work on the superheterodyne. 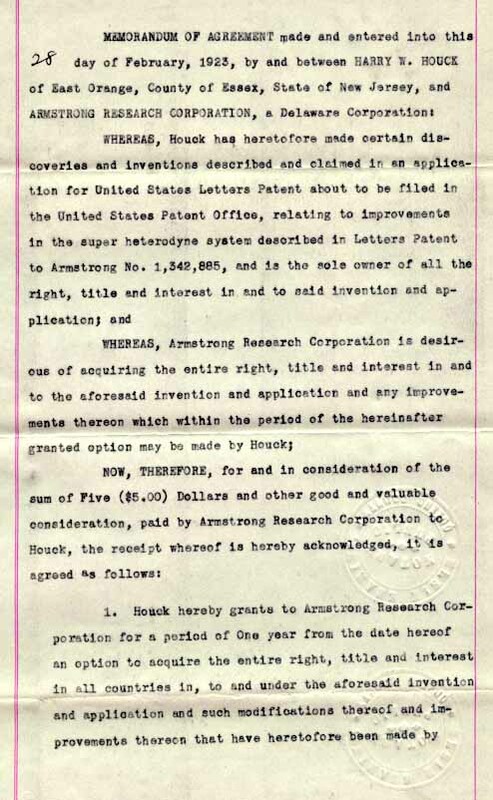 Just a few days before filing for his second harmonic patent, Houck assigned rights to Armstrong.